From November 2016 through January 2018, I worked my way through a portfolio of mostly drawings, with several paintings completed in the latter half of the series. In the end, this has been the most worthwhile activity I have ever pursued as an artist. For the sake of improving my drawing skills and committing myself to a number of drawings far beyond what I produced historically, I endeavored to create 100 self-portraits. I chose the subject matter (me) only because I knew I would be available, at all times, to pose for pictures. I wasn't really sure how I would be able to create 100 different poses, let alone maintain my interest to see the work through, so my first step was holding myself accountable. I had doubts that I could complete the series and did not mention my intention until I produced the second drawing and posted it on Instagram. I figured if I started to slack off, at least my friends or family would say something to keep me honest. The series progressed, and I noticed my work seemed to improve around segments of ten or more works. As I approached the first quarter mark, I finally started to believe I would actually finish the series. Additionally, my connections on social media started commenting on the work. Their words of encouragement kept me motivated, as I had hoped. From November 2016 through January 2018, I worked my way through a portfolio of mostly drawings, with several paintings completed in the latter half of the series. As I approach the end of this series (I'm working on #99, at the time of this writing), I can say this has been the most worthwhile activity I have pursued as an artist. The lessons learned through consistency and commitment are immeasureable. If you believe in the philosophy of 10,000 hours - this is an excellent way to get there. As I work to complete the final two portraits, I'm looking to the future for my next series of 100. We'll see where it takes me. 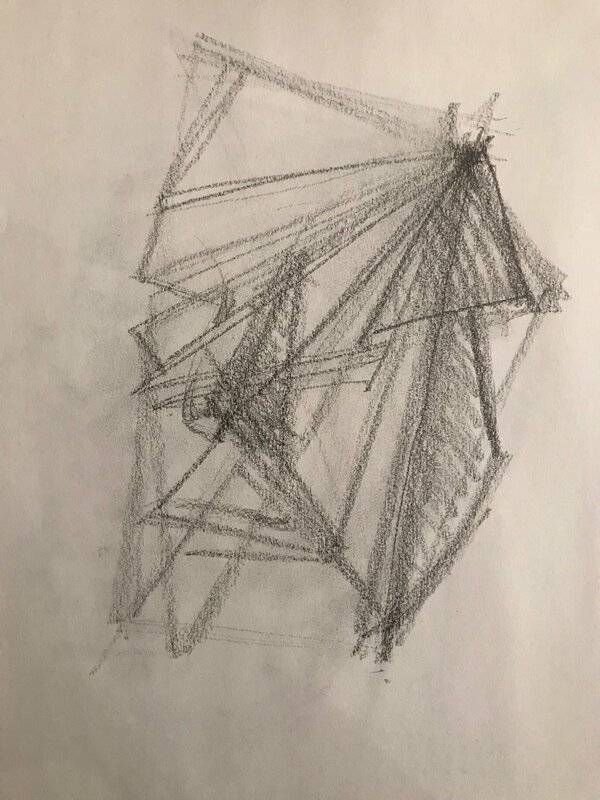 By relating compositional components to one another, I am able to expand context and achieve greater accuracy in my drawings and paintings. Through my studies, I observed my tendency to relate things in terms of their proximity. Upon considering why I do that, I believe it is simply for the sake of convenience. It's very easy to compare or contrast something in relation to whatever is immediately next to it. I've found, however, that In order to improve my understanding of something, it is advantageous to push the boundaries of comparison points as far out from the point of origin as I am able. Thus, pushing me out of a visual comfort zone. The further out I look for a relationship and point of comparison, the more I am able to accurately render it. This applies to shapes, colors, lines, angles, values, and even life. The visual technique that helps me to accomplish this is triangulation. With this approach, I look for a single, distinct point of reference as a source of truth (an anchor), by which I compare all other references. Once that point is established, I look for the next obvious point. From this secondary point, I look for a third point to relate to, in order to further perspective. Of course, I could expand to have additional points, but three seems to be the minimal number required to achieve the accuracy I seek. This is one of several tools I use to interpret the visual world through pattern recognition. The examples above were studies for a self portrait. 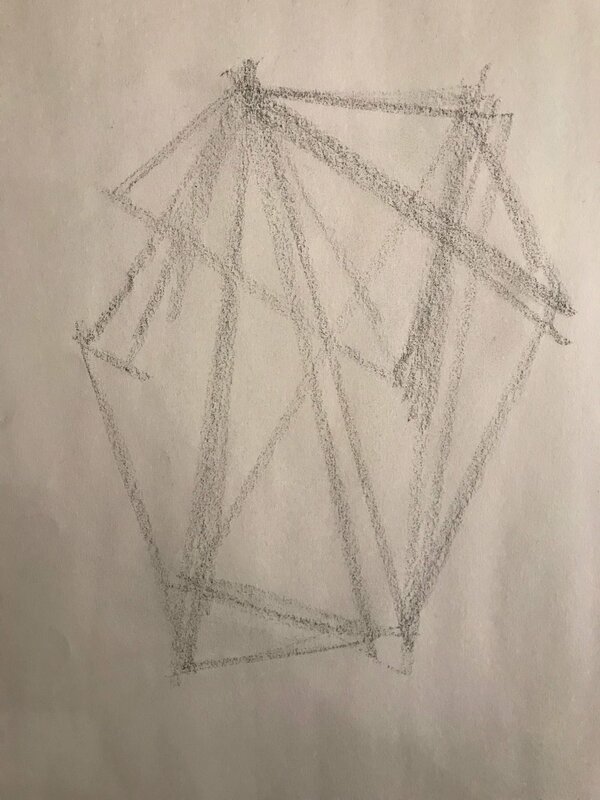 The examples above show the progression of a work in progress, illustrating how triangulation ultimately translates into an actual drawing (self-portrait). She held up the drawing to me- a self-portrait. I asked her what she thought of it and she said liked it, yet admitted she could have demonstrated a wider range of value. I agreed. I didn’t want to say too much. I didn’t want to criticize. That certainly that wasn’t the point. The drawing was merely a mark in time; the beginning of her process. Who was I to judge her perceived self? I explained to her the first time I showed my mug to the public. Mind you, this was not the first self-portrait I ever did, merely the first one I was actually comfortable enough to show. “Your nose isn’t that big,” someone assured me. “Your nose should be bigger,” someone else declared. “Your face is fatter,” I was told. And so it went. I received an equal amount of praise and criticism from friends and family alike... whether I wanted to or not. A portrait is challenging enough, but a self-portrait even more so. We know ourselves better than anyone else but can easily get caught up in preconceived ideas about who we are. Consequently, we tend to view ourselves in a subjective light revealing our own biases and criticisms of ourselves through the rendering of facial features in terms of exaggeration, distortion, addition or omission. In some instances, these embellishments are deliberate, but often this is not the case. Not to mention the complexity of technical skills it requires to draw a face in the first place. 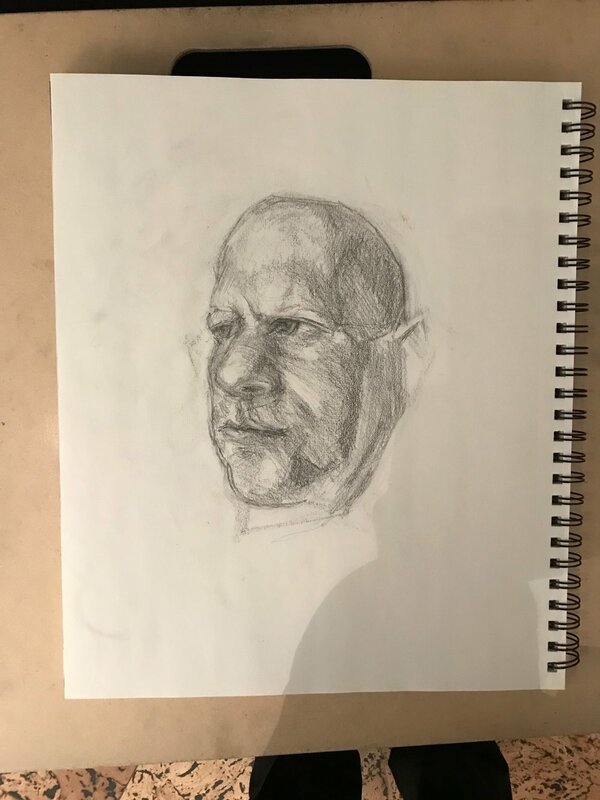 This exercise in self-perception is designed for the artist to learn to view the world more objectively and thus, yield a work that rings true with its audience because it comes from a place of honesty. Finding this honesty in a self-portrait takes practice. It has been over a year since the last self-portrait I painted. After my student presented her work, I felt it was time to do another. So yesterday I drew one (pictured to the right). I think it's good, but there's always room for improvement. We are all just works in progress. Please feel free to comment on any of this. Several months ago, I decided to paint a self-portrait. Over the years, I attempted several self-portraits that produced mixed results. Consequently, I have kept only one painting bearing my likeness (pictured top). This time, I planned to attempt a portrait, borrowing the composition from one of the masters. My latest effort is therefore based off Jan Vermeer's "Georgrapher" (bottom). 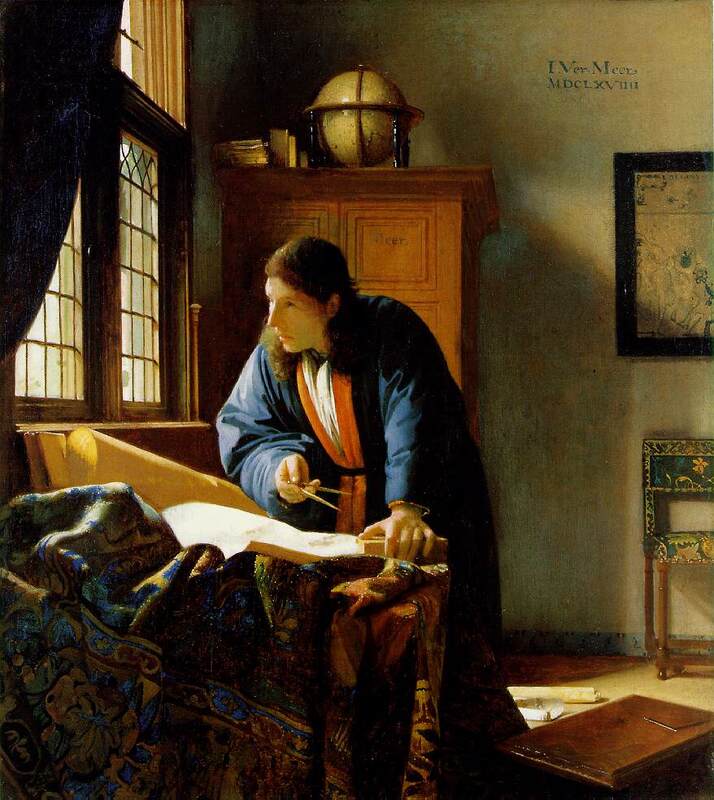 Initially, I was concerned with learning the delicate glazing techniques that Vermeer was known for. As the painting progressed, my path changed course. I diverted from learning Vermeer's glazing and focused on developing and fine-tuning the characteristics that make up a "Jared Steinberg" painting. I think the end result produced my best self-portrait to date that I'm proud to display (center).